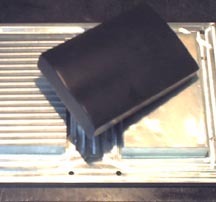 Here is an aluminum mold for producing Resin Transfer Molding (RTM) parts. The RTM process is an innovative way to make high strength parts using techniques similiar to injection molding. The composite design of RTM parts give them exceptional design characteristics, being able to engineer the part for both load and flex patterns. An SLA prototpye for customer acceptance and ergonomics tests. To E-mail Odyssey Engineering click here.